Russia is vast. Russia is wild. Russia is a raw diamond for skiers with an appetite for adventure! Caucasus and Kamchatka are the places to ride. Ask our LUEX travel experts for competitive prices and possibilities of staying in supreme lodges, like former residence of Mikhail Gorbachev. Chat with us and get more details on what Russia has on offer for YOU these days, everything is on the move here! If you’re looking for a skiing or snowboarding adventure that you could call “a black diamond in the rough,” Russia is it. You may have skied in the Alps, or shredded powder in Canada, but nothing compares to the adventure of exploring the wild and exciting terrain, and the untracked powder of Russia. A ski trip in Russia is the chance for the adventure of a lifetime, skiing or snowboarding through the beautiful, vast landscapes of this country that few get the chance to visit while enjoying learning about a new culture, tasting new foods, and meeting new friends. Throughout Kamchatka and the Caucasus, two of Russia’s most popular skiing regions, you can expect major vertical and long lines running down the slopes of some of the most remote places in the world. Many of our trips offer a chance to dig your skis into the powder and tackle steep chutes, cliffs, spines ridges, gullies, and bowls and some of the best tree skiing on the planet. Kamchatka is a volcanic region where you’ll see nature’s sleepy giants, volcanoes, transformed into snowy peaks. 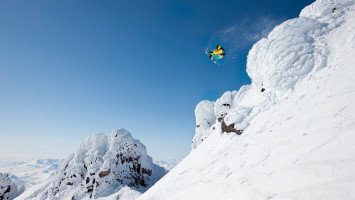 You might even have a chance to see and ski on an active volcano or other areas known for their majestic views of the ocean, two traits which together have earned the region the name “the land of fire and ice.” The annual snowfall in Russia is impressive and dependable, often making for excellent early season ski trips. Skiing through this untamed terrain isn’t for everyone though, so most of our trips are suited for advanced and expert skiers as well as those who are comfortable with hiking and skiing in all conditions. 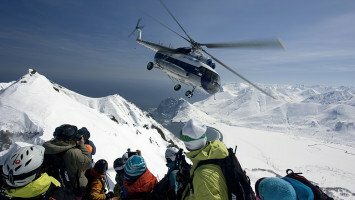 LUEX offers heli skiing trips in both Kamchatka and the Caucasus and resort skiing and ski touring as well in the Caucasus. For skiers that want a truly epic experience, we offer a package with one of Russia’s pioneering heli-ski operators. 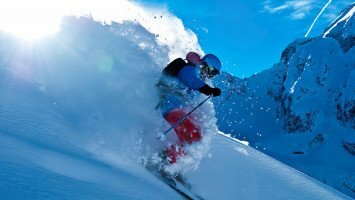 If you want a to ski on the same slopes as some of the world’s greatest athletes, check out our trip that includes a stop at world-famous Sochi, the site of the 2014 Winter Olympics. Along with offering an unforgettable skiing experience, a trip to Russia is also an unforgettable cultural experience. Some of our trips include cultural excursions, giving you a chance to visit small mountain villages or impressive international cities like Moscow. We offer a range of accommodations from cozy lodges and hotels, to unique lodging like staying in the former residence of Mikhail Gorbachev. A ski trip to Russia is perfect for skiers and snowboarders that want to experience skiing somewhere new, without all of the hassle of foreign travel, because many packages include all meals and transportation so you can focus on tearing it up on the slopes. Our ski trips in Russia are perfect for skiers and snowboarders that want big terrain without a big price tag. We offer several trips that are in the budget and mid-price range. If you want to ski in one of the world’s most adventurous unspoiled places, where the sky is the limit and thrills wait around every corner, book a ski trip to Russia and discover what this undiscovered place is all about.